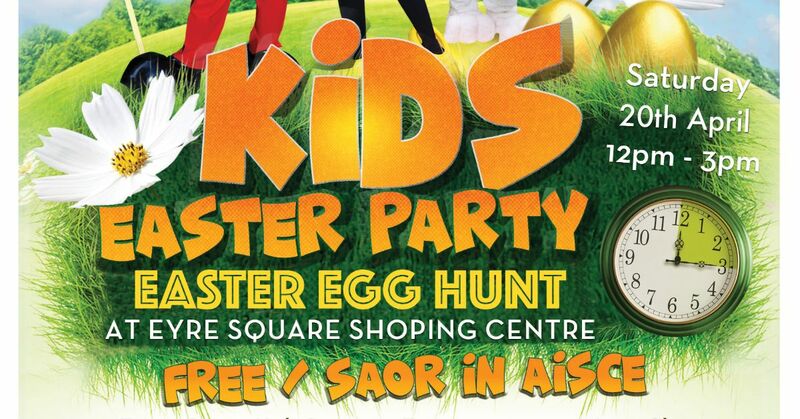 The wonderful charity COPE Galway are combining forces with the Eyre Square Shopping Centre to bring your kiddies the ultimate Easter partay this Saturday 20th April! From 12 noon, we have an array of fun events to suit all ages, from egg hunts to face paint to fancy dressed discos, the kiddies will surely be entertained. And if that wasn’t enough, Bernardo the magician will be making an appearance along with some other cool characters like Peppa Pig and maybe even the Easter Bunny! With plenty of prizes to be won, the little ones will be fit for bed after their day of fun! This event is free and all donations for Cope Galway are greatly appreciated. A special thank you to these amazing local businesses who have helped sponsor this event: Kerr Sherry Ryan Accountants; Kirby Engineering and Construction; The Village Salthill; Helena McElmeel Architects; EasyFix Galway; Colas Galway; Café Temple; Burke Insurances; Monami Construction; O’Toole Transport; C+L Industrial; Carabay Packaging; Winters Property Management; OMS Office Machine Solutions; McCarthy Keville O’Sullivan.